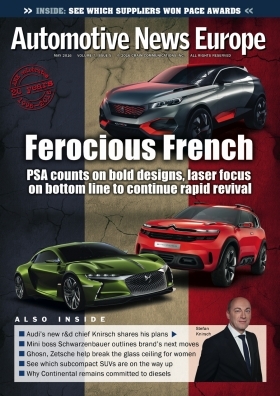 The latest issue of the Automotive News Europe monthly e-magazine goes live on Monday, May 2. This month's edition looks at how CEO Carlos Tavares plans to turn PSA Group the world’s most efficient carmaker. Tavares set the new challenge for Europe’s second-largest automaker after it made a quicker-than-expected turnaround following years of heavy financial losses. Tavares's new plan, called Push to Pass, also calls on PSA to triple its profit margin target, launch 34 new models and generate more cash from its aftermarket, car-sharing and mobility services arms. All of this is supposed to take place while PSA maintains a laser focus on keeping costs down and vehicle prices up. Our cover story package analyzes the new plan and includes an interview with Tavares, in which he responds to criticism that the plan is not ambitious enough. “The purpose of the strategy is to unleash the full potential and the full energy of the company,” he said. Does PSA need a partner to increase its scale and better resist any future market downturns? We share the potential pros and cons of a PSA merger with Fiat Chrysler Automobiles. From France to the UK, Mini sales reached an all-time high in 2015 so the natural question is whether the BMW Group subsidiary could push volume even higher. Peter Schwarzenbauer, BMW Group’s board member for Mini, knows that adding a sedan would boost volume but it also could hurt the small-car brand’s image. Audi’s new head of development, Stefan Knirsch, outlined changes that the company has made in the aftermath of VW Group’s Dieselgate emissions-cheating scandal. He shared his views on the future of diesels and e-motors. Mazda has been on a hot streak in Europe. It increased vehicle sales 21 percent last year and by another 29 percent in the first quarter. Mazda Europe CEO Jeff Guyton has been a key player in this success, which he expects to continue. McLaren Automotive has achieved in seven years what few British luxury brands have managed over far longer periods: consistent profitability. Now it plans to invest about 1.3 billion euros over the next six years to launch 15 new products. CEO Mike Flewitt discussed the challenges ahead. One of the things that Renault-Nissan CEO Carlos Ghosn and Daimler chief Dieter Zetsche have in common is the desire to empower women at their companies. We look at the results of their efforts. An automaker planning a digital service so ambitious it is billed as “doing for car owners what iTunes did for music” would hire a Silicon Valley genius to make it happen, right? Not at Ford. We explain why. Volkswagen Group’s late arrival in Europe’s small crossover segment is expected to make one of the region’s fastest-growing sectors even stronger. Small SUV sales are forecast to double to more than 2 million by 2022 because of forthcoming debuts from automakers such as VW brand, Seat, Skoda, Hyundai and Kia. The only SUV segment growing faster than small crossovers in Europe is premium midsize SUVs. That sector is about to get another big boost from a key new arrival: the Jaguar F-Pace. We find out why Jaguar expects the F-Pace to become the best-selling model in its history. The move toward connected cars has raised the issue of protecting the motorist’s privacy while on the road. Opel’s manager for connected customers, David Voss, explained how his company adapted parent General Motors’ OnStar system to address this concern in Europe. Volkswagen Group’s admission last September to cheating diesel-emissions tests on an unprecedented scale has put added pressure on many automakers. They have to explain excessive NOx emissions from their diesels, especially in Europe. Stricter testing and greater scrutiny of all engines is coming, but that doesn’t worry Continental powertrain chief Jose Avila. The European auto industry began 2016 on a low note, with sharp declines in shareholder value for all automakers, all retailers and most partsmakers. The latest Automotive News Europe/PricewaterhouseCoopers Transaction Services Shareholder Value Indices show which companies buck the downward trend in the first quarter. Also, don’t miss our BMW 100 supplement, which highlights the people, events and models that made the automaker’s the first 100 years so memorable. It also goes live on Monday, May 2.